TimeForge is able to integrate with many different software systems, including accounting and payroll programs such as QuickBooks. QuickBooks is the most popular accounting system for small businesses in the world, and is used by small, medium, and large businesses around the globe. 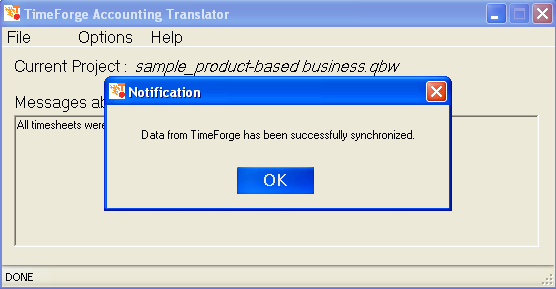 The TimeForge QuickBooks integration involves installing the TimeForge Accounting Bridge software on one of the computers running QuickBooks. If you are using QuickBooks Enterprise, you can install the software on the QuickBooks Enterprise server. The TimeForge Accounting software will read approved time sheets from TimeForge, and then import time cards and weekly time sheets into QuickBooks. With the time sheets inside of QuickBooks, you can pay your employees using QuickBooks Payroll – either by cutting your staff a check, or using Intuit Online Payroll. After you have approved your time sheets from inside of TimeForge, you are ready to run payroll. Make sure you have QuickBooks running, and have opened your company file. 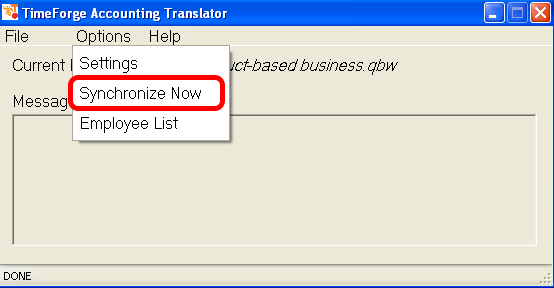 Then, choose Synchronize Now from the TimeForge Accounting Translator to start. Synchronizing your time sheet and payroll data from TimeForge into QuickBooks could take from one to five minutes. Decide if you would like to receive a pop-up notification when the synchronization is complete. 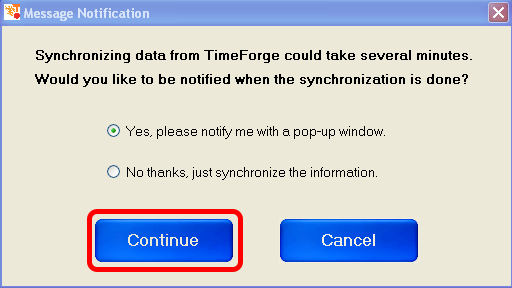 If you choose to receive a pop-up reminder, TimeForge will notify you after the synchronization is successful and the timesheets have been placed into QuickBooks. Any notes, errors, or warnings about the synchronization / import will be shown in the Messages screen. After the time sheets are imported, you can run payroll with QuickBooks. Using QuickBooks, you can run your own checks, or use one of their many options to do electronic payroll.